A firboadenoma is a non-cancerous breast tumor that is most commonly found in women under age thirty. Fibroadenomas are diagnosed in about ten percent of all women in the United States. The tumors consist of breast tissue and connective (stromal) tissue. Fibroadenomas can occur in one or both breasts, but 85-90 percent of women only develop one tumor. Some fibroadenomas are so small they can not be felt. Those that can be detected have a very distinct surrounding tissue. The edges are clearly defined and the tumor has a detectable shape. They are movable under the skin and are usually not tender. Fibroadenomas are often shaped like marbles with a rubbery feel to them. The exact cause of fibroadenomas is unknown, but hormones such as estrogen may play a role in the development of the tumors. In addition, taking contraceptives before the age of twenty may be a cause of developing fibroadenomas. The tumors have also been known to grow during pregnancy and shrink during menopause and can sometimes resolve themselves. There are two types of fibroadenomas: simple and complex. The simple tumors look the same all over when viewed under the microscope, and they do not increase the risk of breast cancer. 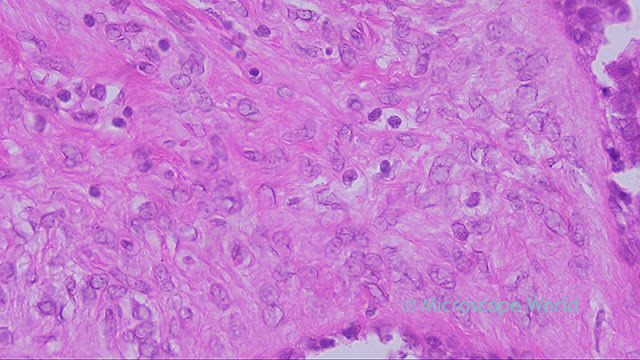 The complex tumors contain other components, such as macrocysts (fluid filled cysts large enough to see and feel without a microscope) and calcification (calcium deposits). This type of tumor slightly increases the risk of breast cancer by 1.5-2 times, compared to women without complex fibroadenomas according to the American Cancer Society. 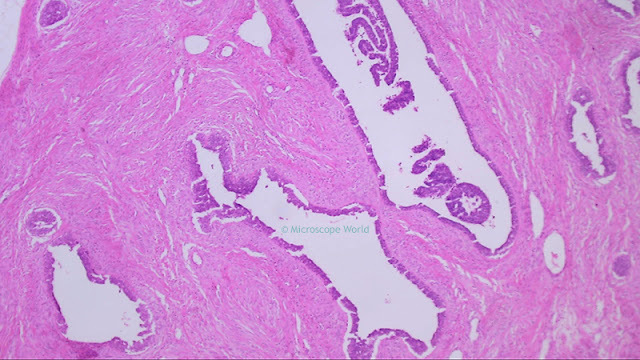 The images below are of fibroadenoma of the breast and were captured using a biological lab microscope with a high definition microscopy camera. 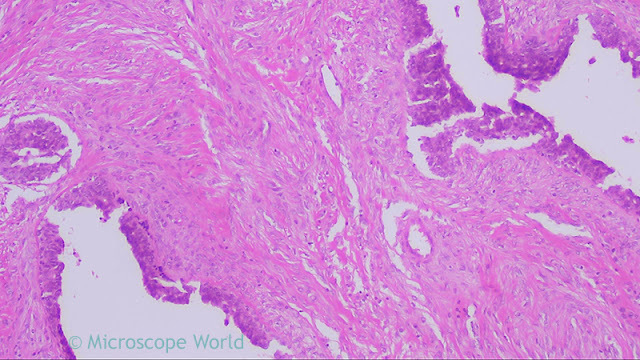 Fibroadenoma of the breast under the microscope at 40x. 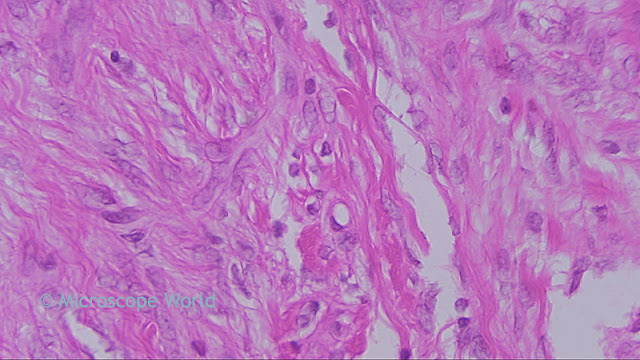 Fibroadenoma of the breast under the microscope at 100x. Fibroadenoma of the breast under the microscope at 400x.